When the Minnesota Vikings and the Philadelphia Eagles met in the NFC Championship game last season, the Vikings were expected to win the day. That, of course, did not happen. Months later and with both teams starting different quarterbacks, they meet again. A win this week doesn’t mean anywhere near as much, but you know the Vikings are going to want to win this one a little bit more than the rest. Carson Wentz is back in charge of the Eagles offense and looking like he hasn’t missed a beat. He is not quite back to where he was, but he is playing well two weeks into his return. But so far, overall, the Eagles are off to a slow start this season having gone 1-1 with each quarterback. With Foles at the helm, you can point the finger a little bit more at the quarterback play. 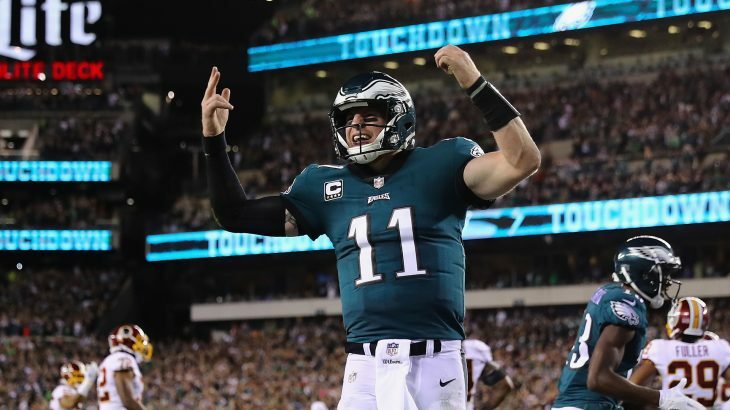 But Wentz went 33-5 for 348 yards and two touchdowns last week, but the Eagles still lost the game in overtime. The problem is simple—the defense is not holding up its end of the bargain. Injuries have played a factor, but not enough to explain why the unit is not performing better. They will certainly have their work cut out for them against the Vikings this week. Case Keenum is now in Denver, but Kirk Cousins seems to have the offense working as well if not better; well—the passing offense at least. Minnesota is fifth in the league in passing but can’t seem to get the running game going (32nd; 63 yards/game). This will be a better game than the NFC Championship game was. The Vikings offense is in good hands with Kirk Cousins, run game or not. However, the Eagles offense appears to be in slightly better hands—Carson Wentz and Jay Ajayi. If the Vikings can get a run game established, they could steal the win. But there is no reason to believe they will. But with Ajayi back in the lineup, the Eagles appear to have a decent rushing attack. Should they get out to a lead late in the game, it is easier to see them kill the clock than Minnesota. It will be close, but once again, the Eagles will win. However, don’t count on the Eagles covering the three-point spread.